As another year rolls along children and sports begin to call. Children and teenage sports are a great way to engage their minds in teamwork and physical activity. But, for some kids over training and exposure to excessive levels of physical activity can present an increased risk of injury. So how do you recognize when a sports injury is minor, or more serious? AMA Podiatry can help you know what to do about them. Often, we never realize this as parents, but the most common cause of injuries in youth sport is either poor quality, or ill fitted footwear. Most popular brands offer a thin shell and very little ankle support. The constant pressure and twisting forces happening during sports, combined with the design of the football boot can add up to a increased risk for foot and ankle sprains and lower leg injuries. Avoid passing on used boots. These fit poorly as they may have been worn down or have moulded to the prior athlete’s foot shape and gait habits. While some shops may suggest a tighter fitting boot (to minimize shifting of the foot within the shoe) remember a tighter fit just adds to the pressure to the toes. With forward motion of the foot, the toes are already under load, so a tighter shoe only compromises this further. As your child continues its skeletal growth, ensure you replace their boots (when required) for proper fit. 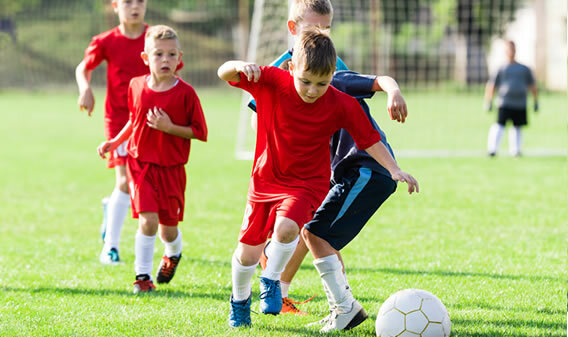 Some injuries that involve children’s sports can range from minor to major, all of them must be taken seriously to prevent symptoms or ongoing injuries. A strain is an injury to the muscle, near the ligament, because of a forceful contraction of the muscle. Either minor to severe and commonly during a sudden turn or change of the foot position causing twisting of the ankle. It is important to have your podiatrist assess your child’s injury for its severity. We recommend treatment with RICE and immobilization; overuse and strain are very similar in treatment. Overuse injuries that are common are either tendonitis (Achilles) or plantar fasciitis (fibrous band running the down the length of the foot). This type of injury appears gradually and becomes worst over time demonstrated by stiffness and inflammation, often presenting with discomfit of the heel bone. Recommended treatment will include RICE and elevation of the affected area. In extreme case a splint or bandage maybe required. but show no bruising and show no evidence on an x-ray. Stress fractures involves rest and time to heal with active children finding it hard to rest the injury or risk aggravating the injury. Toe fractures happen because of poorly fitted boots, common in any sport involving kicking. Symptoms will involve pain and swelling, and it is usually the big toe. Little can be done but tapping and time for the fracture to heel. Ingrown toe nails are common in young sports players with incorrectly fitted sporting boots. They will become more painful the longer they are left. Early intervention with a podiatrist consult can provide treatment and relief. An ingrown toenail if left un treated can progress to infection which can spread beyond the toe.